On this cold 2007 October morning, the 11 of us met in the BPA (Belgian-Palestinian Association) headquarters in order to learn a bit more about the Israel-Palestinian conflict and get an idea of the everyday life in the Occupied Territories. Marianne Blume, Henri Wajnblum and Nadia Farkh welcomed us. Marianne Blume was born in Belgium in 1951. She is a Latin and Greek teacher. "I was born in a family of communist militants and Resistance fighters and I grew up learning not to be satisfied with going through life as an onlooker", she told us. From 1995 to 2005 she worked as a VSO French teacher at Gaza Al-Azhar University. She then wrote a book, “Gaza in my eyes”, that gives a powerful account of what everyday life is like over there. 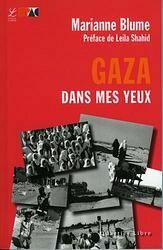 Marianne Blume tells about the Gaza Strip from the inside and her account testifies the extraordinaire vitality of the Palestinians of Gaza, quite a long way from the clichés conveyed by the medias. Today, M. Blume is a member of the BPA and regularly contributes to the Association’s Bulletin. She has published many testimonies and analyses on the situation in Palestine, gives lectures and interviews regularly and takes part in round tables and debates about Palestine, Gaza, the Israel-Palestinian conflict whenever people ask her to. Knowing of her 10-year-long experience in Gaza and her ability to understand and explain things « from the inside », the Belgian Communauté Française asked Marianne Blume to lead the different meetings organised within the Masarat Festival by the Halles of Schaerbeek (Brussels) in September 2008. That is where and when our group met her for the first time and asked her to accompany us in the preparation of our trip. She first offered to relate the broad lines of the history of the Israeli-Palestinian conflict. Since the 19th century, she said, there has been a double history of the « Jewish people » : that of the Jews in the Ottoman Empire and that of the Jews in Europe, which she was now going to tell us about. "The Jews of Europe had been living in ghettos and the victims of pogroms for quite a long time. To get away from it all, some of them already in the 19th century started to imagine creating a state that would be theirs only – yet not especially Israel." Before, Marianne reminded us, Palestine was not a country. It was part of the Ottoman Empire, which was brought down after WWI : the United Nations divided the territory according to their own personal interests (oil, influence on Lebanon…) without at all taking into account which people were living where. The UNO gave England the Mandate on Palestine, England which will then play a nasty double game : on the one hand promising the Arabs they will get Jordan (see the 1917 « Balfour’s letter ») while at the same time ensuring the Jews of a first Jewish Grouping in Palestine. At first, the natives in Galilee, Haifa and Tel-Aviv didn’t react. But the Jewish settling intensified quite quickly : the immigrants either no longer wanted the Arabs who were working for them or exploited them and progressively pushed them away from the cidatels they were now occupying. A certain number of places became outlaw zones : the purchase contracts specified that the Palestinian owners were to hand the lands void of their inhabitants - most of them farming workers who were purely and simply evicted. Bit by bit, work became the exclusive privilege of the Jews, which led the Palestinians to going on strike, first only in the important ports then everywhere : 1936-1939 was the time of the Great Palestinian Revolt both against the British Authorities and the Zionist colonisation. The Palestinian middle class and working class were now fully aware of being despoiled. The first attacks against the Jews occurred then. The repression by the British was bloody, the movement was knocked to bits. Yet it was now clear that the double promise by the English had put the country in a situation that required a solution urgently. The State of Israel was proclaimed in May 1948 by Ben Gourion ( = its independence from the British Mandate). On the next morning, the Arab armies (from Egypt, Iraq, Lebanon, Syria…) entered Palestine. Yet, ill-organised and driven by rival interests as they were, they were easily beaten by the Israeli army. The conflict ended with the eviction / flight of 750.000 Palestinians and Israel’s seizure of 78% of the Palestinian territory. After the war, the Palestinian refugees tried to get back on their lands. There were numerous tragedies as they tried to cross the Jordan : the Israeli soldiers fired at them and prevented them from getting back home despite the vote at the ONU which acknowledges their right to return. The consequence was a « pseudo-war » of takeovers by force by the Palestinian fedayins ( = combatants) while inside another 500 Palestinian villages were destroyed or emptied of their inhabitants. The Jews then called on the « Absentee Property Law » adopted in 1950 : the Palestinians who had left had come back clandestinely, so were officially still away : their lands were thus simply confiscated and went into the Israeli land pool. 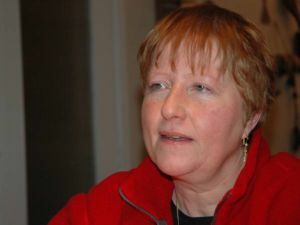 The problem of the Palestinian refugees is at the heart of the Israeli-Palestinian conflict, Marianne Blume told us : from about 700.000 in 1948, they are now 3 Millions living outside Palestine. As for the Palestinians who have never left, the « Arabs of Israel » who have been living on this land since ever, they aren’t better off : they are “displaced people within the country”, condemned to living in certain places, the West Bank and the Strip of Gaza. The Palestinians progressively got organized : in 1964, the OLP, Organisation for the Liberation of Palestine was created in East Jerusalem. The other Arab countries (the Arab League) were not that much interested in the Palestinian cause but saw to it that their interests were defended. In June 1967, the 3rd Israeli-Arab war started and drove about 200.000 Palestinians to exile (most of whom already 1948 refugees). The map hereby gives an idea of what was left to the Palestinians after the 1967 war : 22% of the historical Palestine. In 1969, Fatah and DFLP (Democratic Front for the Liberation of Palestine) declared themselves in favour of a « democratic and secular Palestinian state » in which Jews, Christians and Muslims would have the same rights and duties. But in 1970, under USA pressure, the Jordanian King eliminated the Palestinian forces settled in his country : the fedayins then fled to Lebanon. In 1975, the Civil War began in Lebanon : the Palestinian fedayins, together with the Lebanese « islamo-progressists », opposed themselves to the Christian Lebanese Right (the Falangist militia), who had Israel’s and Syria’s support. The Jews want to annex Jerusalem, the « eternal and indivisible capital of the Israeli people », but since the Palestinians demand the recognition of a Palestinian state with Jerusalem as capital, Jerusalem is at present divided into two. In 1980, the Israeli State officially annexed East Jerusalem. In 1982, the Israeli army invaded Lebanon : the OLP forces were thrown out of the country and dispersed in the neighbouring Arab states. 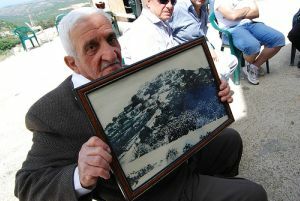 This was when the Sabra and Chatila massacres took place. 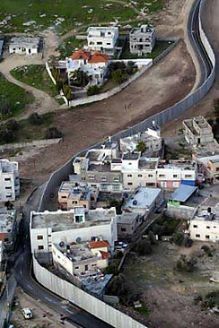 In Palestine, Marianne Blume insisted, the occupation is also economic : neither Gaza nor the West Bank are developed. The Israelis don’t allow the Palestinians to establish new industries, build or dig wells. The rate of unemployment is high since there is nothing to do there. The Palestinian and Israeli economies are interwoven : the Palestinians used to go and work in Israel. They made up a cheap and available reserve manpower. But then, Israel didn’t want these Palestinian workers anymore. Now, it uses people from the Philippines and from Sri Lanka, who are ill-treated and have no decent status, Marianne Blume commented. And she reminded us that the international law obliges all the states to care for the well-being of their population. In the same way, it forbids the states to change internal dispositions… which Israel does with complete impunity while being an occupying power ! Henri Wajnblumis the President of the UJPB, the Union of the Jewish Progressists of Belgium, an association in the tradition of the defense of humanistic and universalistic values, civil and social rights that struggles against all forms of injustice and discrimination and is resolutely committed in the defense of democratic values as well as against everything that could jeopardize them : exacerbated nationalisms, discriminations on ethnic, religious, political or philosophical bases, growing racism and xenophobia, the resurgence of anti-semitism and the reappearance of fascistic theses, social and civil exclusions, the denial of the genocides of the Armenians, the Jews, the Gypsies or the Tutsis in Rwanda. True to these values, the UJPB rejects the Israeli-centrism and the pro-Israeli "patriotism " of most community institutions, be it in its themes for reflection or its audience. "Since the Israeli governments is assuming the right to speak in the name of all the Jewish people, the UJPB has always been concerned about allowing another Jewish voice to be heard in this conflict, whose origins go back to the 1947 division plan, which carried within itself the denial of the national rights of the Palestinian people. Since 1967, the UJPB has denounced the policy of occupation and colonisation of the territories that were annexed after the Hebrew State was born. It declares itself in favour of a fair settlement of the Israeli-Palestinian conflict which should guarantee security to both peoples while taking the tragic question of the Palestinian refugees into account. Its commitment is made clear notably through its active support to the Israeli and Israeli-Palestinian organisations as well as to the various Palestinian movements of non-violent resistance to occupation that are working for peace and the application of equal rights to all the citizens of the State of Israel, Jews and Arabs" (see UJPB Chart). See Carte blanche de l’UPJB in Le Soir, 2008 May, translation in English hereunder. Henri Wajnblum briefly interrupted Marianne to explain to us that there is a real culture of security in Israel : "For the Jews, everything is a problem of security, all solutions involve security as well. This can be of course explained by the Holocaust : the older people have kept a very strong feeling of fear, they are afraid of vanishing. As for the little reaction Europe shows to the Israeli occupation, it can be explained by the guilt Europeans feel to the concentration camps. But the younger Israelis make a political use of this historical fact. In the Jewish schools, for ex, the children are taught nationalism (« everybody wants to get rid of us »)… We must really take care not to become extreme, Henri Wajnblum warned. The fact you have suffered doesn’t give you any right". He then went on with what Marianne Blume was saying about the OLP : "Nobody likes it when people get organised to resist. "And he told us how, under the OLP aegis (with Arafat outside Palestine and between Palestinians in Palestine), different movements started to organise resistance against the Israeli occupation, sometimes in a very trivial way (closing the shops at a time the Israelis didn’t expect, dressing exclusively in red, green, white and black – the colours of the Palestinian flag – refusing to adopt Winter time …) but also via the intifada (= revolt, uprising), in response to Golda Meir who had proclaimed that Palestinians didn’t exist… At that time, the word « Palestinian » itself was not used anymore! Marianne Blume resumes her account of the historical background again : "There was then a civil and popular resistance that wanted to show to the occupant that the Palestinians did exist : an identity resistance. In 1987, the first intifada (= civil resistance) was launched from the inside : the Israelis imposed various two-week-long curfews, the Palestinians were forbidden to leave their house -> they stocked up with food. The Israelis closed down the Palestinian schools and universities (even though (or because) for the Palestinians, education is of great importance) -> the teachers rented flats and taught there in secret. The Israelis confiscated tools, forbade the Palestinians to cultivate theirs fields -> they started cultivating every bit of land, or on their terrace (and before that, under their tents) to support themselves… The Israelis were at a loss in front of all the tricks the Palestinian people invented to counter the interdictions. In 1988, the OLP (via Arafat) acknowledged the existence of Israel and denounced « all forms of terrorism » in front of the UNO. In 1990, the massive immigration of Jews coming from the ex USSR began. The 1987 intifada led to the 1993 Oslo Agreements, which were supposed to bring up a “step by step” solution to the conflict. These Agreements meant a lot to the Palestinians : it was indeed the first time Israel recognised the OLP, which was at last allowed to come back to Palestine. Gaza and Jericho progressively won their autonomy back. However, not everything in these Agreements was good for the Palestinians : the territory is now divided into zones : A-zones (= autonomous Palestinian zones / liberated towns (Gaza, Jericho, Ramallah) under Palestinian authority which is supposed to have all the power (in education, health…), B-zones (= Israel ), and C-zones. These C-zones (= 60% of the territory) stay under Israeli control / administration / security. They are in fact settlements (established by Israel in the West Bank and Gaza in order to one day occupy the whole territory) and the territories between them, and between them and the autonomous B-zone. A settlement, Marianne Blume explained, is a kind of entrenched camp equipped with all the necessary electrical and water systems, military protection (make it 2 soldiers for each settler), as well as a whole road system (built on Palestinian lands) for the exclusive use of the Jewish settlers and enabling them to go to Tel Aviv. The Israeli army is everywhere in the C- zone, where it multiplies the obstacles for the Palestinians (checkpoints, blocked roads, walls….). The map hereby helps understand the extent to which Israel has kept gaining ground : after Oslo, only 12% of the historical Palestine was left to the Palestinians : the Oslo Agreements didn’t prevent the development of Israeli settlements nor the confiscation of Palestinian lands. "2000 was the year of the Camp David summit. The press reported Ehud Barak (Israeli Prime Minister) to have made generous offers which Arafat was said to have turned down, that way ruining the peace process. The truth is Palestine was going to be severed 10% of its territory, while the Palestinian refugees were still denied their right to return : Barak managed to de-legitimatize Arafat in the eyes of the whole world by convincing it that, in fact, the OLP leader didn’t want peace with Israel. Only in 2002 did the UNO recognize the need for a Palestinian State. Yet, that is also when the construction of the wall began: "The Palestinians had accepted that Palestine should be built on the Gaza Strip and West Bank but the map below clearly shows that the line of the wall (black line : completed in 2007, red line = still to be done) doesn’t follow the amnesty line decided in 1967 (discontinuous line) : Israel goes on eating away territories…"
However, if you have a close look at the hydrological map of the country, you easily notice that the wall, more than a security wall is a despoilment wall that winds around the ground water reserves and wells. As for Jerusalem, it was first annexed, then surrounded by Jewish settlements to form today the « Great Jerusalem », (hachured in green on the map + planned wall around the Maale Adumim settlement) a wide territory including the settlements, from which the Palestinians are excluded (cf C-zones). The latter need a permit to go from one place to the other and have to make hour-long detours before they can get there. If you now look at the pale yellow zone of the West Bank, you understand it corresponds to the (rich !) Jordan valley which contains several settlements (little triangles on the map), which were decided to be a military zone forbidden to the Palestinians (except if they are the owners of their lands : but how can one work one’s lands alone – since the land-workers are not allowed to go ? 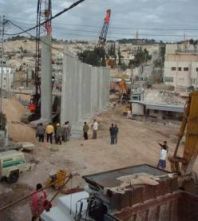 ), and which Sharon planned to surround by a second wall… "
In the same way, lorries carrying diary may stay stuck for hours at a checkpoint : the pretext is always security but in fact, it is a way to contain the Palestinian people, kill its economy. In Nablus, for example, no lorry can go into nor leave the town. The Israelis apply the back-to-back system, i.e. a coming lorry is searched, than unloaded into another lorry on the other side of the checkpoint, which raises the transport costs and consequently the cost of the produces… You should also know, M. Blume added,that the Palestinians can only buy from the Israelis : if there is no flour left, they just aren’t allowed to go and buy some elsewhere... Having a cell-phone is simply vital for the Palestinians : when they leave home, they can never know when they will come back because of all their difficulty to move around". Henri Wajnblum explained then how the main trend of the Zionism claimed all the Palestinian territory for the Jews. “They did this in a left perspective, i.e. to bring up the workers’ emancipation. The 1947 division plan didn’t satisfy the Palestinians nor the Jewish leaders. After proclaiming the birth of the Israeli State in 1948, Ben Gourioun said : « we are taking » , well aware that there would be a war and that Israel was militarily strong enough to take more territories. As Marianne told you, this policy ended with 750.000 Palestinians evicted (through terror operations in the villages) for an exile without possible return (cf the 1950 « Absentee Property Law »). 430 villages were destroyed, the others occupied by the Jews who established their kibboutz there. 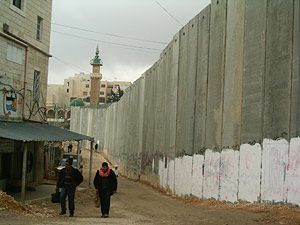 Today, there is that wall, which shows Israel’s will to push the Arabs even further, to annex even more territories : it is dreaming of as large a state as possible, clear of Arabs, totally homogenous. The settlers, who were about 200.000 at the time the Oslo Agreements were signed * (1993), are now more than 400.000. Colonisation was intensified in order to create facts on the ground and be able to negotiate the creation of Palestine from a strong position. The settlements, all established in a planned, strategic way, are the advanced forces of the State of Israel, H. Wajnblum commented. 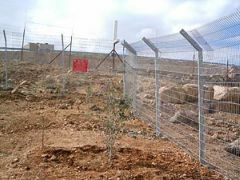 Today, in the Palestinian territories, the settlers benefit from a total impunity and are becoming more and more violent, uproot olive trees while the militaries look on impassively and so on. Generally speaking, they are hard-line nationalists or religious people convinced that they are invested with a divine mission… and thus are there legitimately. In Gaza, there are now no settlers anymore but the zone is completely locked : the Palestinians live there like in a prison, watched over by the Israelis who decide which produce can go into or come out of it, and by the Egyptians who obey the USA pressure. In Hebron today, 450 settlers (all working in Israel) poison the Palestinians’ everyday life. Their flats overlook the once flourishing souks and they throw their rubbish on the passers-by’s heads. In Bethlehem, which is completely hemmed in by the wall, scarcity and begging are the rule. The town is economically dead as a result of colonisation : the Palestinians are forced to leave, some of them (more especially the Christians) have gone abroad to the USA or South America… But where can the Muslims go?, H. Wajnblum wondered. In Jerusalem, if a boy falls in love with a girl from the West Bank, she doesn’t have the right to go to Jerusalem while he will lose his ID card if he goes to the West Bank…"
And Henri Wajnblum pointed out how much today’s policy works at making the other one invisible : in the West Bank, the Israeli is the soldier at the checkpoint, in Gaza, Israelis simply don’t exist. 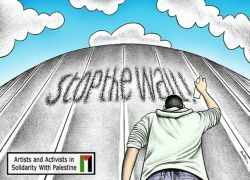 And the other way round, the wall makes the Palestinians invisible to the Israelis, who are not allowed to go into the Occupied Territories officially for their security, in fact so there is no attempt at fraternizing. Taayoush (= living together), a Jewish-Arab movement considered as a traitor to the national cause. the Refuznik : reservist Israeli soldiers who have decided not to serve in the Occupied Territories anymore nor to take part in the repression and humiliation of the Palestinian people. the 18-year-old ones Movement, made up of Israeli students who already claim they will refuse to serve in the Occupied Territories. the elderly ladies Movement, i.e. grand-mothers who organize sit-ins, watch the checkpoints, report what happens there and question the young soldiers on what they are doing. 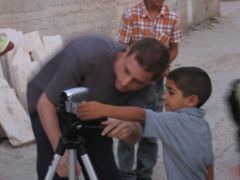 distributing video cameras to the Palestinians so they can film what’s going on. distributing folders to pupils at the school gates to explain occupation (the Israeli memory ignores the Palestinian one : pupils get a real brainwashing at school. In the folders for ex, the 2 anniversaries will be opposed to each other : the 60th birthday of the creation of Israel versus the 40 years of occupation since the 1948 Nakba (= catastrophe) for the Palestinians. « Breaking the Silence », an exhibition set up by former soldiers with all the car-keys they confiscated in Hebron : « The people of Israel must know that we behaved like real bastards in the Occupied Territories». Henri Wajnblum insisted on the remarkable criticism Israeli film-makers dare to make of what happened or is happening and strongly advised us to go and see « Avenge but one of my two eyes » (by Avi Mograbi) and « Lemon Tree ». Again, he said how admirable the civil resistance of the Palestinian people is, who keep sending their children to school (getting an education = escaping ostracism) or symbolically planting olive trees again… He warmly recommended us to go and watch « Hebron Emotion » and « Checkpoint »). "The Palestinians, he repeated, are not anti-semites. They are against the Israeli government. They say : « When people talk about us, it is always in relation to the Israelis, as if we were only half people : we don’t exist as full Palestinians, we don’t exist as full citizens in a fully recognized country »". 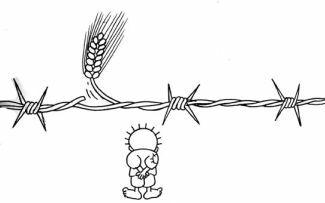 As a way of conclusion, Henri Wajnblum revealed to us what a Palestinian had confided to him : « Nobody knows the concession it had been to accept to live inside the 1947 new frontiers, while at the bottom of your heart, you keep the image of a Palestine in its integrity ». On May 14, the State of Israel will be 60. This anniversary will be or is already celebrated in the whole world, in Israel of course, but also in all the Jewish communities of the Diaspora as well as in different capital cities, not to mention in the media, which are devoting important dossiers to it. We, Progressist Jews of Belgium, are not going to join in these celebrations. Indeed, we consider the time for rejoicing has not come yet. On May 6, Israel started its cycle of commemorations with a Remembrance Day devoted to honouring the memory of the Israeli Jewish victims of the endless Israeli-Palestinian conflict. On the same day, the Combatants for Peace Movement – which groups together Israelis and Palestinians who used to be soldiers but now favour dialog and non-violent action against the occupation and colonisation of the Palestinian territory, an organisation notably created by Elik Elkhanan, whose 14-year-old sister, Smadar, was killed in a suicide attempt in Jerusalem on September 4, 1997 and by Bassam Aramin, whose 10-year-old daughter, Abir, was killed by an Israeli border guard in front of her school on January 16, 2007 –, on the very same May 6, the Combatants for Peace Movement organized a parallel ceremony to honour the memory of all the Israeli and Palestinian victims of this 60-year-long conflict. Our thoughts also go to all the victims. The State of Israel, created by the November 29, 1947 division plan, has been a reality for 60 years, acknowledged by the international Community as well as, since 1993, by the Palestinian Authority. The Palestinian state however, though also created by this division plan, is still but a potentiality. This is all pure fabrication. Indeed, no evidence can be found of such calls in the Arab states’ radio programs, which were all recorded by the BBC. Yet there is little chance that this will be said during the official celebrations of the 60th anniversary of Israel. Little chance again that someone recalls that between the UNO decision to divide Palestine on Novembe 29, 1947 and May 15, 1948, date of the end of the British Mandate, the Jewish forces had already evicted 250.000 Palestinians by force and destroyed about 200 villages. Six months later, there will be around 800.000 Palestinians to have been constrained (again by force) to take the road to exile, in conformity with a plan – the D-plan (« Daleth » in Hebrew) – meticulously finalised on March 10, 1948, as the new Israeli historians report on the basis of archives that had been declassified, and more than 500 villages will have been destroyed. Finally, little chance that someone mentions that on November 17, 1947, 12 days before the division vote, Golda Meir, representative for the Jewish Agency, concluded with the King Abdallah of Transjordan, a tacit agreement on the sharing-out of Palestine, quite different from the one decided by the UNO… That way, about 80 % of the territory would pass to the Jewish state while the 20 % left – the West Bank – would be annexed by Transjordan. The fate of the Palestinian state was sealed even before it had been created on paper. It is these decisions, taken by Zionist leaders who didn’t at all want to see a Palestinian state rise next to Israel – no more than they wanted a State that wouldn’t be ethnically as homogeneous as possible –, that are at the origin of the tragedy of the Palestinian people, a tragedy that has amplified since June 1967 with the occupation and colonisation of the West Bank and the Gaza Strip. It is high time now, Israel failing to do so, walled up as it stays in its official historiography of a clean and exclusively defensive war, it is high time now the international community recognized it at last and didn’t satisfy itself with nice words to bring the second section of the division plan to a successful conclusion. Only on this condition shall we celebrate the anniversary of the state of Israel, together with the first anniversary of the Palestinian State, two states whose citizens, whatever their ethnical origin, enjoy the same rights.